It’s not often that you’ll see me extolling a dish for its hearth healthy qualities. It’s not that I don’t care about good health, it’s more that I prefer to focus on eating a diet that is balanced, with the philosophy that “all things in moderation” will render it unnecessary to have to specifically seek out recipes that are low cholesterol or low fat or whatever. 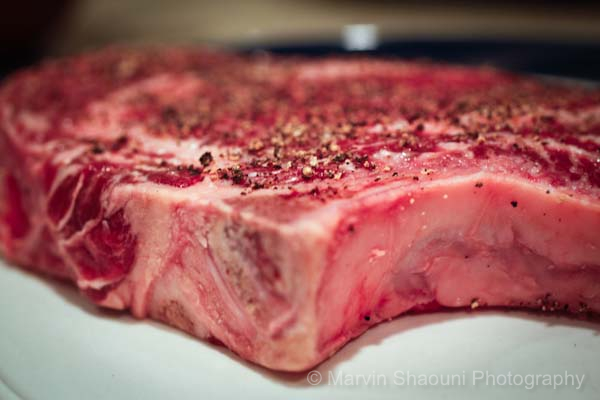 But at the beginning of this year, Marvin let it be known that he’d like us to eat less meat and more vegetables and grains. He specifically requested whole grain salads, which I already make from time to time and which are great for quick lunches when you have the hectic schedule of a freelance photographer. I happily obliged by adapting a recipe from Once Upon a Tart (a great cookbook for soups and side salads) with wheatberries, beets and pomegranate. 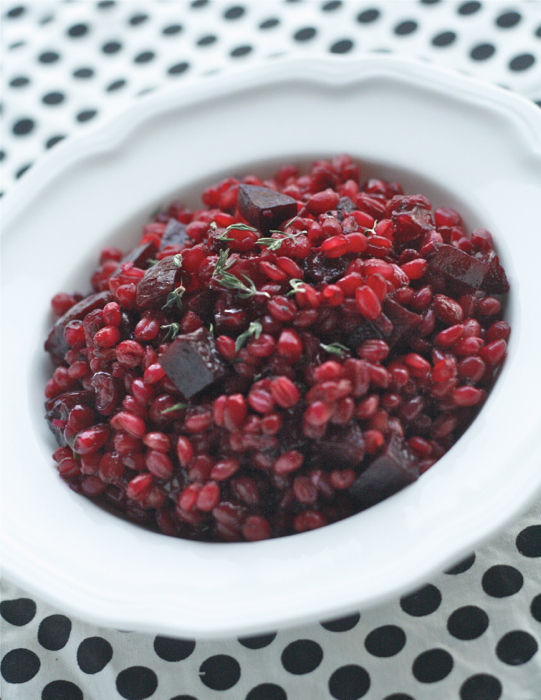 The recipe instructs you to fold in the beets and pomegranate at the end so they don’t stain the salad, but I wanted the dramatic, deep reddish-magenta hue to soak into the wheatberries… so much prettier and seasonally appropriate. The salad is quite good as it is, but even better with a little crumbled feta or fresh goat cheese on top. (This I would add at the last minute though, since I draw the line at pink cheese.) Although there’s no reason not to make this any time of the year, it would make a dramatic Valentine side dish- I plan to serve it alongside a venison tenderloin tomorrow. And you can serve it feeling comforted in the knowledge that you’re not potentially bringing about your loved one’s early demise with rich foods. 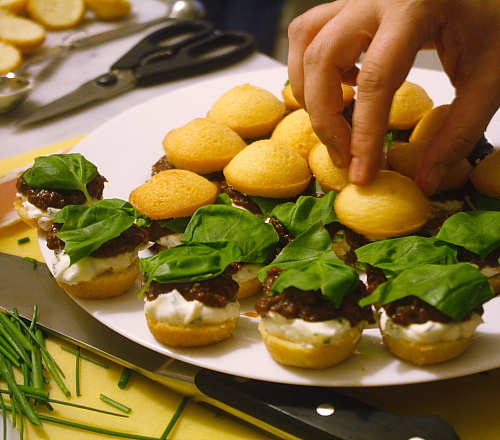 If you do have a decadent main dish or dessert planned, no worries- it’s all about balance. Preheat oven to 425°. Toss the beets with a little olive oil, salt and pepper and place on a foil-covered baking sheet. Roast until they are easily pierced with a fork, about 25-30 minutes. Meanwhile, put the wheatberries in a medium pot with a lid. Cover with plenty of cold, salted water. Bring to a simmer and cook, covered, until done (about 20 minutes)- they should yield to the tooth but remain pleasantly chewy. Drain, return to the pot, add the cherries or cranberries and cover (this helps plump the fruit). While the beets and wheatberries are cooking, combine the shallot, pomegranate juice, vinegar, and salt. You can do this in the bowl you plan to serve the salad in. When the beets have cooled enough to handle, cut them into ½-inch dice. Place all ingredients except olive oil in a serving dish and stir well to combine, adding the olive oil after the wheatberries have had a chance to soak up some of the vinegar and pomegranate juice. Taste and adjust seasonings, adding more salt, vinegar or pepper as needed. 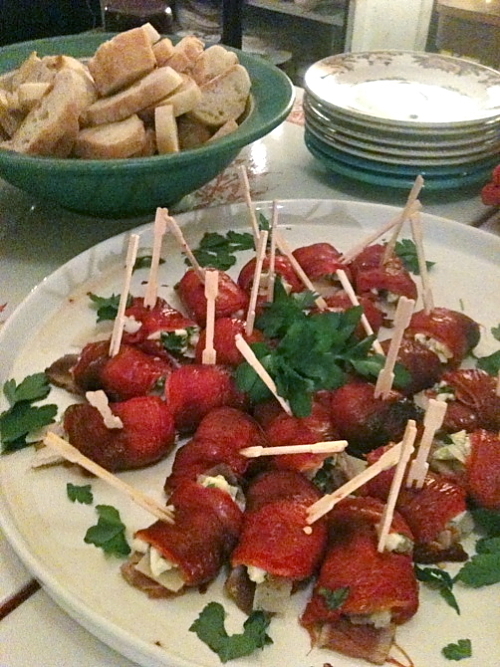 If desired, serve with crumbled feta or goat cheese on top. My in-laws are serious eaters. 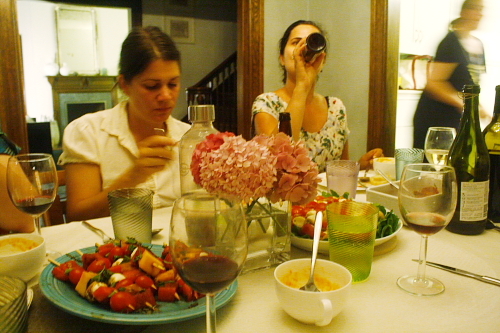 At all the gatherings I’ve attended, the quantities of food would make the Two Fat Ladies blush, and we always come home with several containers of leftovers. This Christmas was no exception! My mother in law hosted Christmas Eve, as is getting to be the tradition. She veered away from the usual Puerto Rican fare this year (roast pork, arroz con gandules) and went Mexican, making posole, ceviche and nopales (cactus) salad. One of his cousins brought an interesting new (to me) PR dish of chicken gizzards cooked with green bananas and a few green olives (something like this except it was served warm instead of like a salad). The dish is an unglamorous greyish color, but the flavor was great and the gizzards were much more tender than when I’ve made them. It re-inspired me to try making gizzards again after an unsuccessful attempt last summer. With all this great food in such abundance, it’s always hard to know what to bring. My MIL never wants to assign me a dish; she always demurs, saying that there will be enough food, or to just bring “whatever I want”. I know this is because she doesn’t want to impose, but I have somewhat mixed feelings about it… she knows I like to cook; I’m part of the family now; shouldn’t that warrant a side dish assignment? To be fair, for all I know she does the same with all the other relatives and they just bring whatever they feel like. But a small part of me would be flattered to be entrusted with something specific. In the end, I just decided to make a dessert… you can never have too many, especially with his family’s sweet tooth! I didn’t feel like leaving the house for groceries, so I “shopped my pantry” and made a Meyer lemon pound cake with a lemon cream (lemon curd + whipped cream) to go on top. Although I’m not the biggest dessert/ cake person, I do love citrus (see these posts) and almost always have lemons in the house! I wasn’t sure if its simplicity would be appreciated, but to my delight it was almost gone by the end of the night, when richer and sweeter offerings remained. This recipe is from The Gourmet Cookbook, one I turn to often when I’m looking for a recipe that’s traditional yet updated. 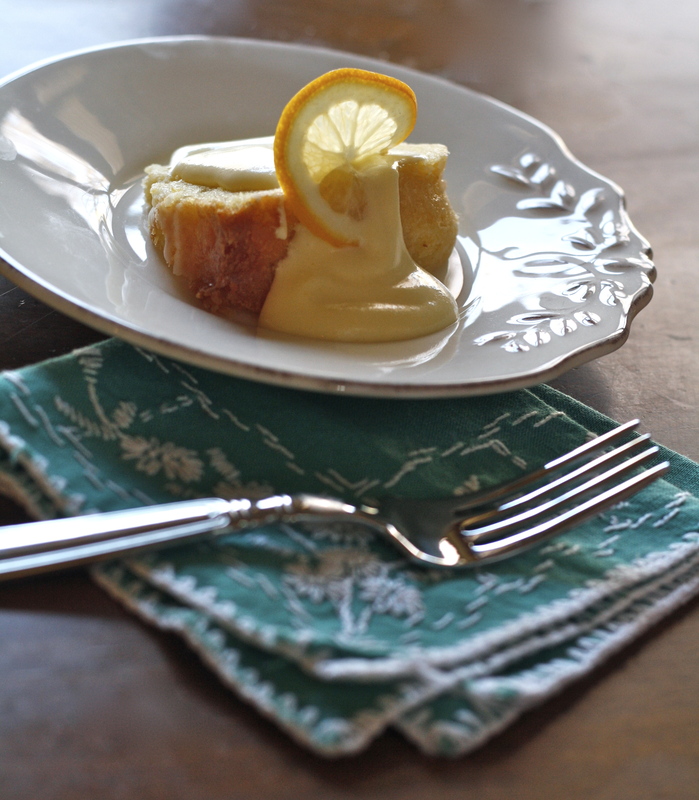 The method is simple, and you can certainly serve the cake as-is with the lemon glaze rather than making the lemon cream (although you need to zest all those lemons anyway, so you may as well use them). I did an easy curd where you mix everything and cook it together rather than tempering the eggs; it seemed to work about the same. You’ll want to strain it for textural reasons, but that’s about the fussiest part of the recipe. And I know a heavy cake recipe is probably the last thing you’re looking for right now, but you never know when you might decide to have people over for tea, or when you might need an easy recipe for your next get-together with your in-laws. 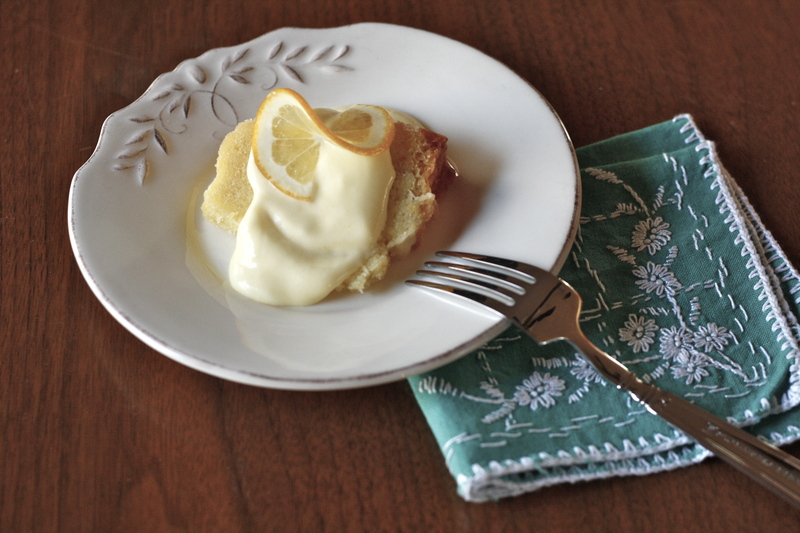 I made this cake with fragrant Meyer lemons, but regular lemons will do just fine. 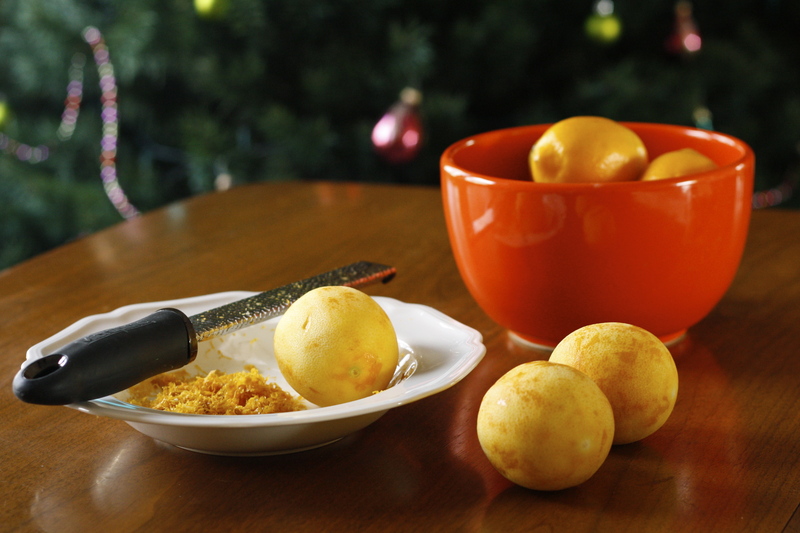 However, you will likely need more lemons for the curd if you don’t use Meyers, which tend to be much juicier. Lightly grease and flour a 2-quart kugelhopf pan or bundt pan (a neutral-flavored cooking spray works well to get in the nooks & crannies). Knock out excess flour. Place a rack in the center of the oven and preheat oven to 325°. 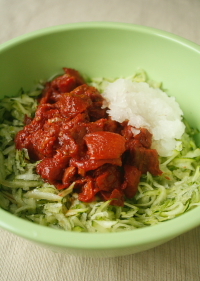 In a medium bowl, whisk together the dry ingredients and zest. Cream the butter and sugar in a stand mixer or with an electric mixer until pale and fluffy, 2-3 minutes. Add eggs one at a time, beating well after each addition; then add vanilla. Reduce mix speed to low and beat in ⅓ of the flour, the milk, another ⅓ of the flour, the lemon juice, and the remaining flour, beating until just combined and scraping the sides of the bowl as needed. Pour the batter into the prepared pan (place on a baking sheet for easier transport in and out of the oven) and bake until top is browned and a skewer or knife inserted into the center comes out clean (original recipe specified 45-55 minutes but mine took about an hour and 10 minutes). Meanwhile, make glaze by combining powdered sugar and lemon juice until sugar is fully dissolved. 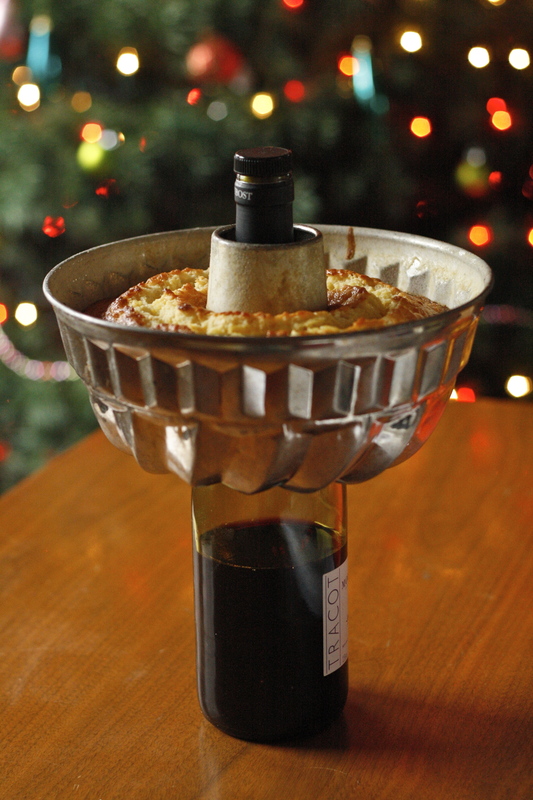 Cool cake in the pan for 15 minutes (see photo- a wine bottle works well for this). Invert on a rack and allow to cool completely before glazing. 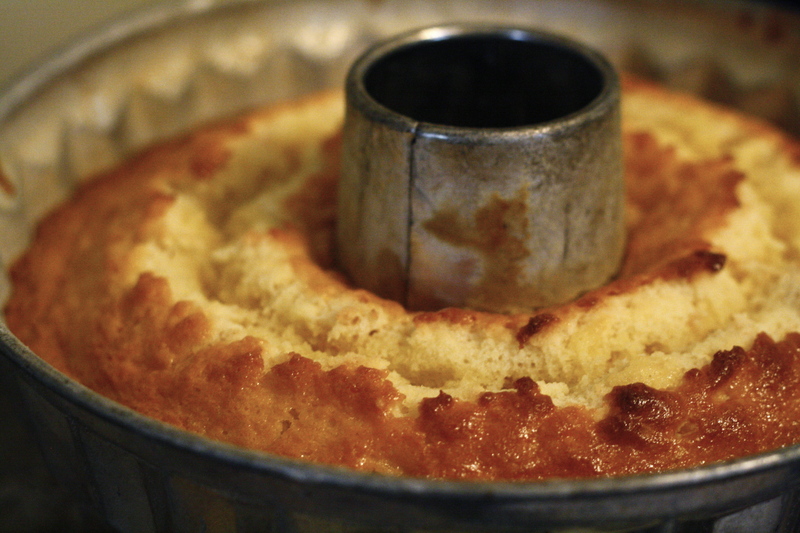 Put cake on a serving plate and pour glaze over top, allowing it to drip down the sides. If storing for later use, allow glaze to set before covering. 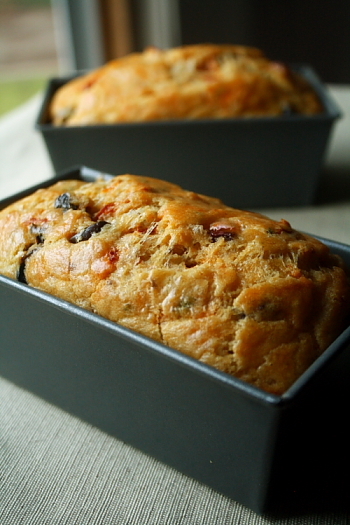 This cake keeps well for several days if wrapped and refrigerated; allow to come to room temperature before serving. Note: in Dorie’s book, she uses the term “lemon cream” to refer to a variation on lemon curd containing a higher ratio of butter. Whisk together all ingredients in a medium heavy saucepan. Place over medium low heat and cook, stirring vigorously and constantly, until butter melts and mixture starts to thicken (original recipe says 4-6 minutes but I’ve never had mine cook that fast). The curd is done when you can make a track with your finger on a spoon or spatula and the curd doesn’t run into the track. It will look thin, but thicken as it cools. 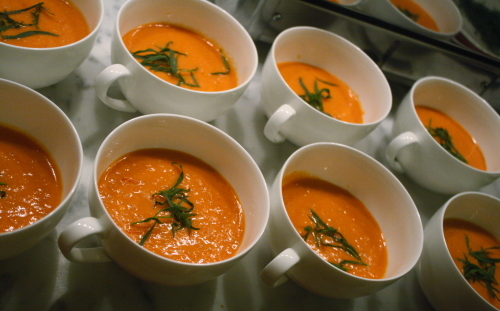 If desired, for a smoother texture, strain curd while still warm through a fine mesh strainer into a bowl. Press plastic wrap over the top so a skin doesn’t form, and cool in the refrigerator. 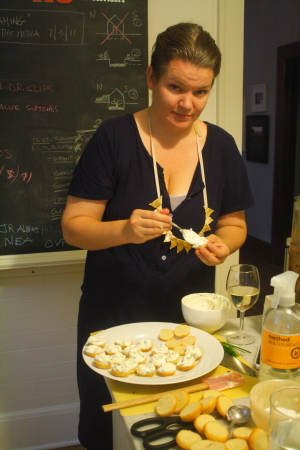 To make lemon cream, whip cream with beaters or a stand mixer until it has body, but before it becomes firm. When curd has fully cooled, stir in whipped cream to taste- less for a more pronounced lemon flavor and more for a milder, creamier flavor. It’s an understatement to say I’ve never been drawn to cauliflower. I wouldn’t go so far as to say I hate it, but it’s certainly not a favorite, especially when steamed or raw (allow me to insert an immature “blech“). So it was pretty uncharacteristic of me to pick up a head of it while we were shopping for dinner. But leave it to New York Times food writer and cookbook author Melissa Clark to make something as unsexy as cauliflower sound appealing. I’ve been making my way through her book In the Kitchen with A Good Appetite as bedtime reading, and came across a section where she talks about roasting vegetables- when in doubt, crank the oven to 425°, give the vegetable(s) a sheen of olive oil and a generous sprinkling of salt, and in 40 minutes or so, you’ll have roasty caramelized goodness. I’m no novice when it comes to roasted vegetables, but sometimes it takes someone else’s enthusiasm to reignite interest in a tried-and-true method. Coincidentally, that morning I had come across an article in this month’s issue of Saveur by Lesley Porcelli entitled “The Soft Approach”, about cooking vegetables past what common kitchen wisdom would deem done. As someone who has never appreciated, say, the overly vegetal, grassy taste of a near-raw green bean, I recognized a kindred spirit. 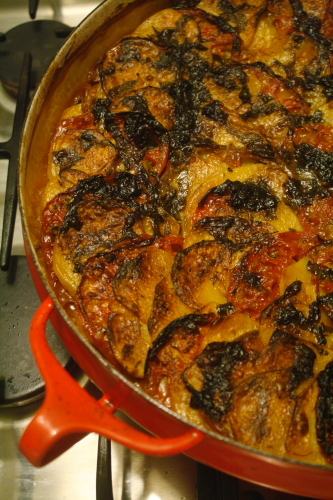 Porcelli talks about cooking vegetables as her Italian grandmother did, to the point where their sweetness develops; a stage many would call overcooked. This is exactly what I planned to do with my cauliflower: heat-blast it into submission. I preheated my oven and cut my cauliflower into bite-sized florets. Into a large bowl it went, tossed with olive oil and salt, and then dumped on a baking sheet. If I’d been at home, I might have sprinkled on some additional seasonings at this point as Clark does in her recipe, like smoked paprika or even curry powder, depending on what I was serving it with. I put the cauliflower in the oven for 10 minutes before adding whole peeled cloves of garlic and chunks of red onion (also tossed in oil and salt). In retrospect I probably could have added the garlic from the beginning, but I wasn’t sure what the timing would be and didn’t want to risk it burning. When the onion and cauliflower were done, the garlic was soft and cooked through but not browned at all. Still, smashed and smeared on a piece of rare rib-eye and dragged through the tomato juices on our plates, neither of us was complaining. To finish the dish, I sprinkled on some fresh chopped parsley and squeezed a bit of lemon juice over everything to brighten the flavors. 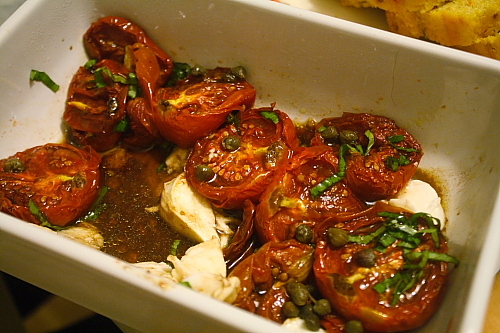 Next time I might follow my friend Evan‘s lead and add capers and a dash of good-quality vinegar (a combination which I raved about in this post). For someone whose attitude toward cauliflower has been ambivalent at best, I was more than pleased at my results and would definitely repeat the experiment. In fact, if I’d had enough left over, I would have played around with a roasted cauliflower & garlic soup. Note to self: next time put an additional tray of veg in the oven to be used for this purpose! All photos this post courtesy of the hubs. Check out his sweet new website. 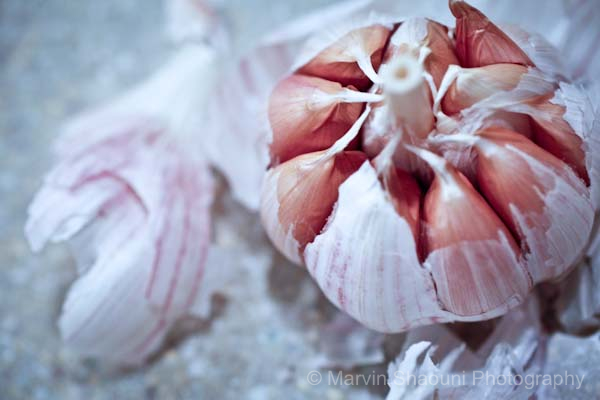 You can change this recipe up in a dozen different ways- substitute a sweet onion for the red, or leave it out altogether; ditto for the garlic (although… roasted garlic!). Add spices as you see fit, or finish the dish with the simple parsley/lemon combination I used. In her version, Melissa Clark uses whole spices cumin, coriander and mustard seed for an Indian-influenced dish, adding sliced almonds in the final 5 minutes of cooking. I was away from home and didn’t have my spices, so I settled on this simpler version. Note: If garlic cloves are on the small side, add them with the onions after the initial 10 minutes of cooking so they do not burn. Preheat oven to 425°. Rinse cauliflower and trim away any brown spots. Cut into small bite-sized florets, about 3/4″ to 1″. 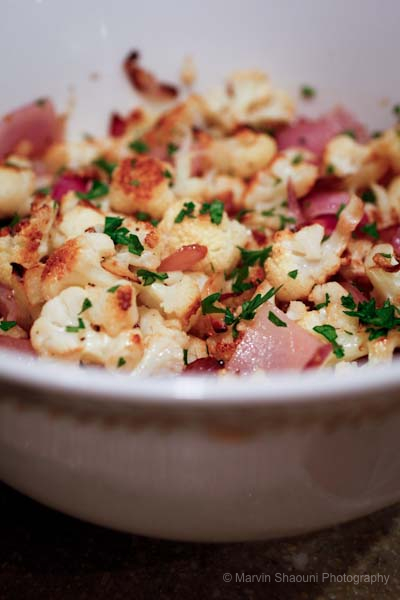 Place cauliflower in a large bowl with the garlic cloves and toss with just enough olive oil to coat. Toss with sea salt to taste, about 1 teaspoon, and pepper or other spices if desired. 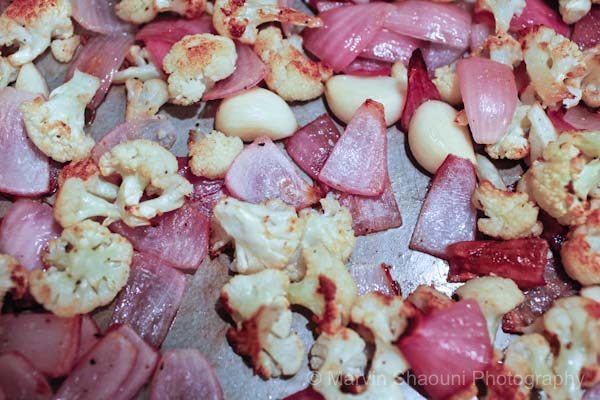 Spread cauliflower and garlic on a baking sheet large enough to hold it all without crowding; ideally, there should be a little space between all the pieces so they roast and don’t steam. Place in the oven for 10 minutes. Meanwhile, cut the onion into 1″ pieces; toss with olive oil and salt. When the 10 minutes is up, give the cauliflower a stir and add the onion. Cook for another 10 minutes and stir again. Continue cooking for a final 10-15 minutes or until cauliflower has plenty of browned spots (see photo). Transfer to a bowl and finish with the lemon juice and parsley to taste. Sample and adjust any seasonings as needed. For someone without much of a sweet tooth, I make a fair amount of ice cream. I’ve been thinking about why that is, and I think it’s the fact that there are so many possibilities (endless, really) when it comes to flavor. Unlike baking, which requires a bit more precision, ice cream making has a lot of wiggle room when it comes to proportions. Recipes vary wildly in the amount of eggs, dairy and sugar called for, and somehow all end up yielding a fairly similar end product. As long as you understand the basics of making a custard (and many versions don’t even require that! ), you can vary the other elements a great deal and still get a good result. Add to that the fact that making ice cream doesn’t require turning on the oven, and usually only dirties one bowl and one pot, and you have some pretty strong motivation for turning your creative energies in that direction. 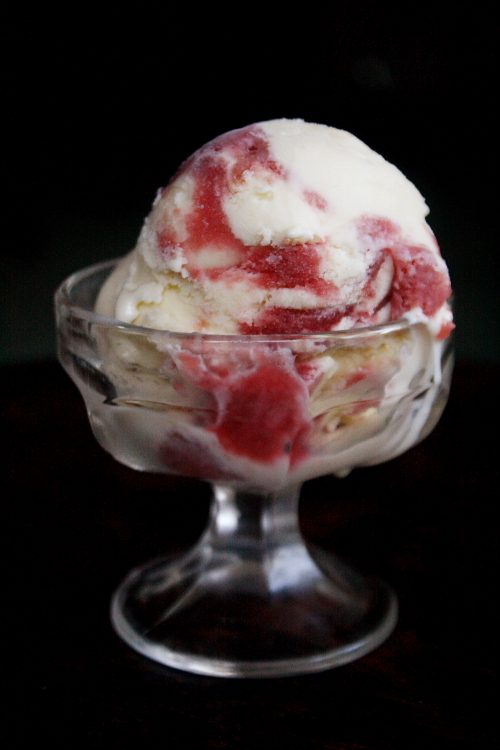 The second ice cream I made, a few days after the first, was designed to use up some rhubarb I’d over-enthusiastically purchased at the farmers’ market. I made a rhubarb sorbet with St. Germaine (an elderflower liqueur) that turned out so-so, but still had a fair quantity left over. I made a basic vanilla custard, a rhubarb purée, and combined the two into an ice cream that tastes like rhubarb pie à la mode. I made the custard slightly sweeter than I normally would, to balance out the pucker-tart rhubarb, and it turned out just right. After making the ice cream, I thought of a better way to get the “ripple” effect (detailed in the recipe), but I suppose there’s always next time for that. 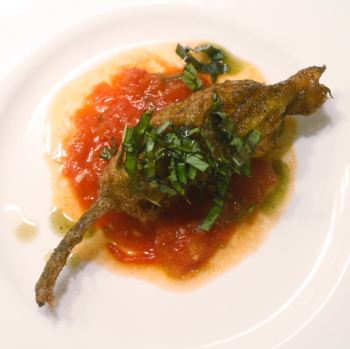 Meanwhile, I offer you these recipes, two of my best to date. The other half of my household, who happens to get very uncomfortable if our ice cream supply ever threatens depletion, is in full agreement. Heat the milk and 1 cup of the cream in a medium saucepan until steam begins to form on the surface. In a bowl, stir the egg yolks with the honey. When the milk is hot, stir it into the eggs about ¼ cup at a time; return entire mixture to the saucepan. Cook over medium-low heat, stirring constantly with a whisk, until the custard coats the back of a spoon (a swipe with your finger should leave a clean trail). 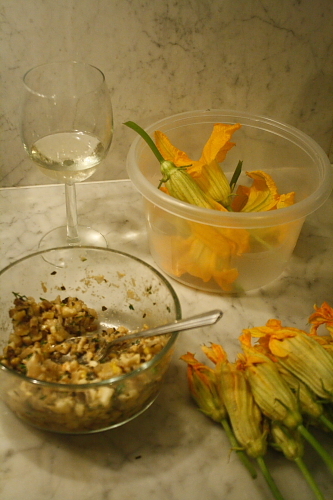 Add the orange flower water and remaining 1 cup cream. If you like, strain the custard through a fine-mesh strainer to remove any eggy bits. Put in the refrigerator to chill. 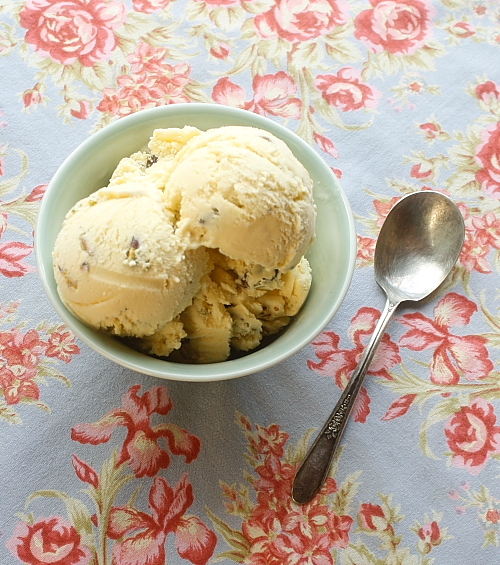 When completely chilled through, freeze the custard in an ice cream maker according to the manufacturer’s instructions. 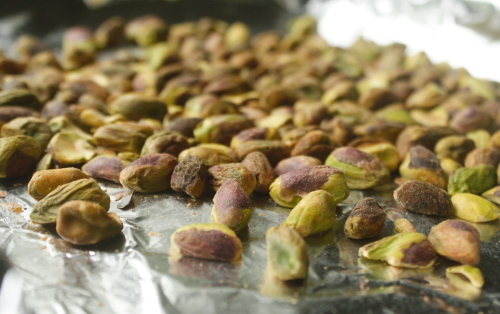 Meanwhile, toast the pistachios either in a dry skillet on the stove over low heat, shaking frequently, or spread on a tray in a low (250°) oven or toaster oven until warmed through. Either way, watch them closely, as nuts burn easily. Allow enough time for the nuts to cool before adding them to the ice cream. 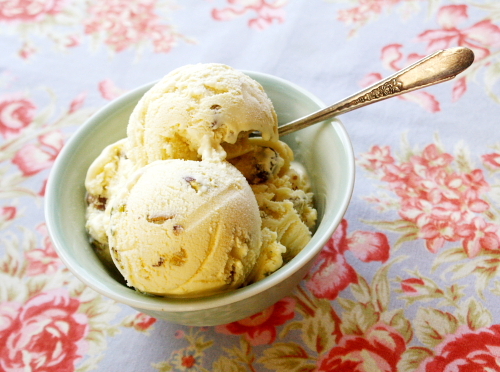 When the ice cream is the consistency of soft serve, stir in the pistachios. Pack into a container and place in the freezer for about 2 hours to set. Makes about 1 quart. Heat the milk and cream in a medium saucepan until steam begins to form on the surface. In a bowl, stir the egg yolks with the sugar and vanilla. When the milk/cream is hot, stir it into the eggs about ¼ cup at a time; return entire mixture to the saucepan. Cook over medium-low heat, stirring constantly with a whisk, until the custard coats the back of a spoon (a swipe with your finger should leave a clean trail). If you like, strain the custard through a fine-mesh strainer to remove any eggy bits. Put in the refrigerator until completely chilled through. To make the rhubarb purée, combine the rhubarb and sugar in a medium saucepan and cook over medium heat until the rhubarb is falling apart. 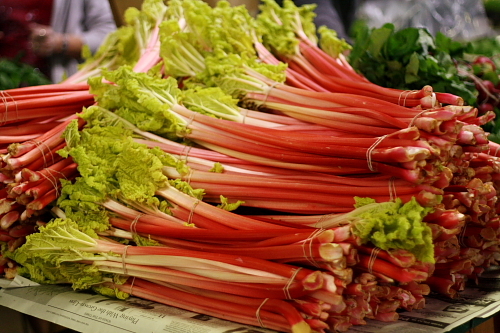 You’ll need to stir at the beginning so the sugar doesn’t burn, but the rhubarb will quickly begin to render its juices. If you have an immersion/ wand blender, use that to purée the rhubarb; otherwise, you can use a regular blender, but don’t over-mix as it adds too much air to the purée. Transfer to a zip-loc bag and chill thoroughly. When completely chilled through, freeze the custard in an ice cream maker according to the manufacturer’s instructions. Snip the tip off one corner of the bag containing the rhubarb. Layer the ice cream in your chosen container, squiggling the rhubarb over it as you go. Place in the freezer for about 2 hours to set. Makes about 1 quart.